A red wolf pup born in the wilderness of northeastern North Carolina today would probably die before finishing its natural lifespan, according to a five-year status review issued by the US Fish and Wildlife Service this week. The red wolf, which federal officials have designated as endangered, could be extinct in the wild within eight years. Wolves in the wild can live as long as 13 years. In captivity, the median lifespan is 10 years. With fewer potential mates, the wolves have also interbred with coyotes imported from other states — by humans. Sea level rise, another human-induced phenomenon, also threatens the wolves’ habitat. However, critics of the agency note that USFWS failed to accept any responsibility for its role in the wolves’ demise. And some scientists have questioned whether the wolves’ failure to thrive in the wild is a self-fulfilling prophecy — a ruse to move the remaining animals to zoos. As Policy Watch reported in 2016, it is true that USFWS has undercut its own recovery program, a flagship of the Endangered Species Section. The agency hasn’t introduced any new wolves from zoos into the wild. Nor has USFWS prosecuted anyone for illegally killing the wolves. Nor has it explored other potential recovery areas. USFWS also eliminated its full-time red wolf recovery coordinator position, and abandoned its placeholder program. That program allows wildlife officers to trap, sterilize and re-release coyotes to keep them from interbreeding with red wolves and diluting the species’ gene pool. It has also reduced its red wolf tracking program. And in 2015, the agency, which even then was deliberating the future of the recovery program, signaled more bad news for the red wolf. It inexplicably ended a three-year educational red wolf project that it had undertaken with the Red Wolf Coalition, based in Columbia, NC. The red wolf was listed as endangered in 1967 and declared extinct in the wild in 1980. In 1995, a special rule was put in place to manage an experimental population of captive-bred red wolves in five eastern North Carolina counties. 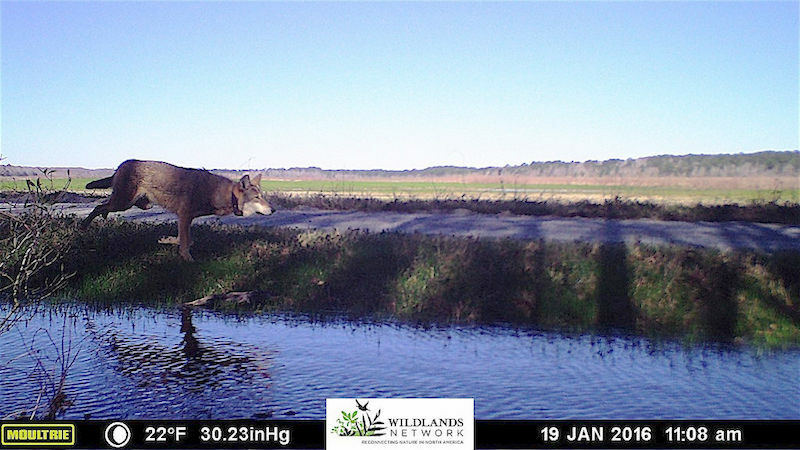 But a handful of landowners oppose the relocation because the wolves left the public lands, such as Alligator River Natural Wildlife Refuge, and wandered onto private property. The agency did little to ameliorate the tensions among those landowners, the wolves and residents who supported the relocation program. “The red wolf population decline has been catastrophic, yet the Fish and Wildlife Service has not only failed to address that decline, it has actively contributed to it,” said Sierra Weaver of the Southern Environmental Law Center. In late 2016, the SELC had successfully petitioned a federal judge to prevent USFWS from allowing private citizens to trap or kill a red wolf. Previously USFWS had suggested rounding up all of the red wolves from the Albemarle Peninsula and placing them in zoos, an unpopular proposal among conservation biologists and wildlife advocates. About 200 red wolves live in captivity, including several at the NC Museum of Life and Science in Durham. Three red wolf pups were born there this week.